The original photo that was cropped for the newsletter "header." could be used as a graphic element that could set off a “slice” of another image with some of the same colors. (To see these two photos side by side, go to page three of the newsletter link here). 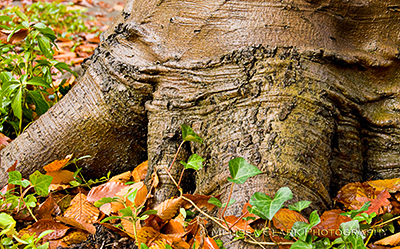 The adjoining photo, which was also cropped as a "slice" to go next to the beech roots. I loved the way he used my photos and it inspired me to shoot with an eye for images that would look interesting cropped narrowly in a horizontal format. So when I started a blog at WordPress, I knew I wanted a theme with a customizable header that I could change whenever I felt like it, to take advantage of the same idea. If you’ve been reading this blog (and my thanks to those of you who have!) but have come to it only recently, you may have missed some of the first headers. Here’s one I used around the holidays. This is a cropped photo from a Christmas tree at Longwood Gardens. The font is Papyrus. Nice, but hard to read. I use WordPress’ ‘Sapphire’ theme, which calls for images 740 pixels wide by 180 pixels high. 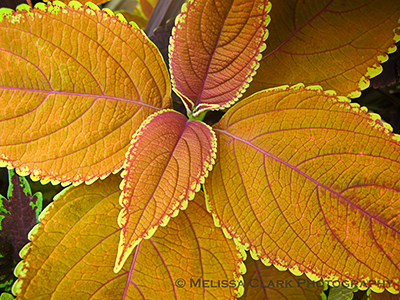 I find a photo I like that has a background where type will be readable, crop it to these dimensions in Photoshop, and put my “Garden Shoots” header text on it. Then I save the cropped image as a low-resolution JPEG file and upload it as my header. I used a font color sampled from the golden yellow of the iris' eye to make the text stand out against the green background and white of the flower in this header. I tried white type on this header but it wasn't very readable. The font is Gill Sans MT. The next one is one of my favorite headers so far. 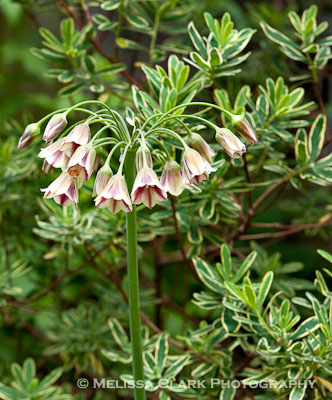 I took the photo at Brookside Gardens and cropped it so the the Nectaroscordum siculum is primarily on the left with space for the text on the upper right-hand side. Another spring favorite was the allium with baptisia, a shot taken in a client’s garden. Same font, this time slightly smaller to keep it from running into the allium. 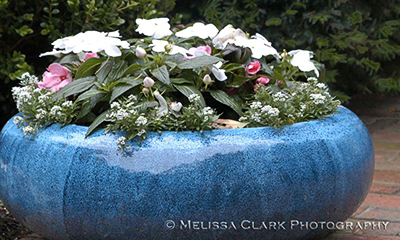 The possibilities are endless, and can include larger garden scenes. A Sissinghurst Garden "slice" which could be used as a header. The upper-right hand corner of the photo is dark enough for white type, and just about the right size since the alstroemaria in the left side of the image are what's important. I don’t want to give away what’s in store for the upcoming months so I will close here. But here’s an offer for anyone with a customizable header and a photo you like. Send me your name, either by e-mail at gardenshoots@gmail.com or by leaving a comment on this post, and I will randomly select one entrant as the winner of a custom header for your blog. Details to be worked out later, but I promise to get it done within a month of the drawing. Deadline for submitting comments or sending e-mails is July 10, 2010. And thanks for reading! 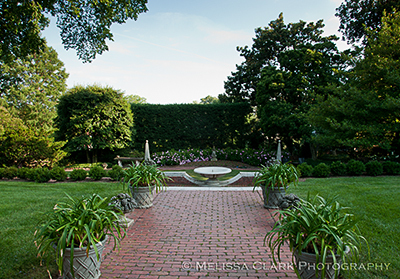 On Wednesday evening of this week, I joined a group of landscape design colleagues from the local chapter of APLD for a rare opportunity – a visit to the gardens at Evermay, a private estate in Georgetown. 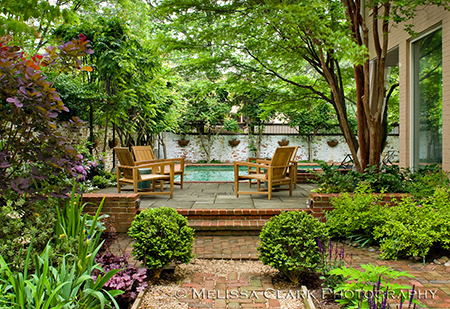 When I think of Georgetown gardens, the first word that comes to my mind is usually “tiny,” closely followed by “boxwoods.” Well, I was half right – but in for some surprises as well. 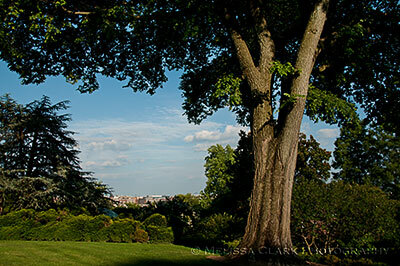 The view from the south terraces of the Evermay estate, framed by a mature elm tree, reaches far beyond Georgetown. At the outset, we were greeted by Mr. Harry Belin, Evermay’s current owner and the grandson of Lammont Belin, an architect who is primarily responsible for the creation of the terraced gardens on the estate. Mr. Belin was the most gracious of hosts, welcoming us and thanking us for visiting the site. The estate, which comprises 3.5 acres in the heart of Georgetown, is currently on the market for $29.5 million; Belin had driven in from Potomac, where he now lives with his wife, to meet us, introduce us to his gardener, and answer questions about the gardens and the estate. 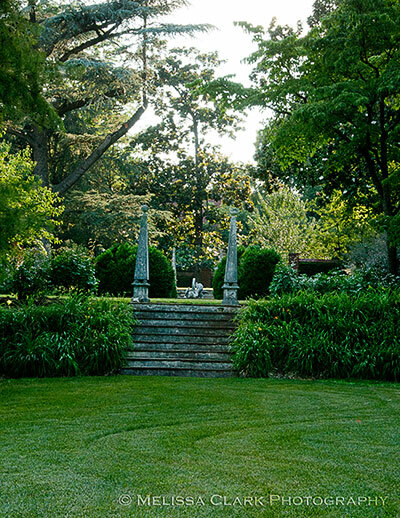 We started the tour at the north side of the house, where a circular driveway with a large granite fountain sculpture – purchased from the Blisses, who owned Dumbarton Oaks – provides a focal point. ( Mr. Belin explained that because of budgetary constraints, none of the fountains were on at the moment, and so all the pools we saw were empty.) The “real” front of the house, to which we were promptly led, is on the south side, where a large terrace leads into a series of connected “garden rooms”, designed to provide separate areas where visitors could gather in more private groupings. It was at this point, looking out at the terraces below and as I began to walk around, that I started to comprehend the challenge for the next owners of this enormous property. Just maintaining what is here – somewhat understated though it is in terms of plantings – is quite a challenge, and one that the current gardener has done admirably. There are clipped ivy patterns on many of the retaining walls, mature boxwoods that have suffered some winter damage but still remain viable, and large swaths of lawn that looked recently mowed in appealing curved patterns. Note the curved mowing patterns in the lawn leading up to the steps. Neatly tended rectangles of lawn break up the brick paths on the first terrace below the main terrace to the south of the house, and the stone obelisks also seen in the photo above make their first appearance. 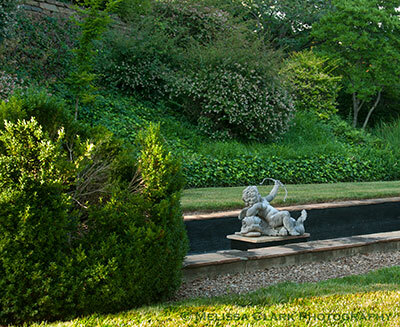 The hillside beds between the first pool (with cherubs, see the second photo below), could use some more imaginative plantings than the large abelias that now dot them. A hillside planting of Abelias in groundcover on one of the lower terraces at Evermay. 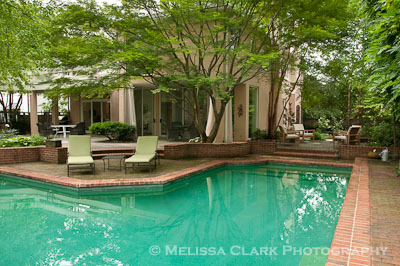 The empty areas between the lawn and pool may have been planting beds for annuals. 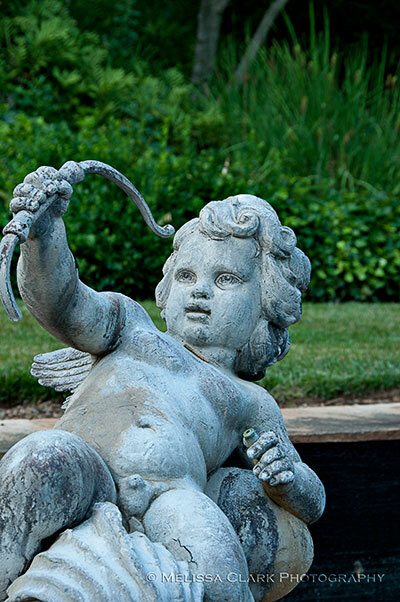 Two cherub sculptures adorn the pool shown above. Here and there on the lower terrace, I saw borrowed views over and through the brick walls. 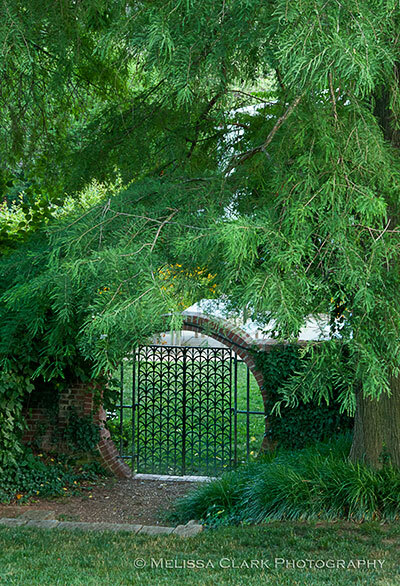 A "moongate" with an elaborately-designed double copper gate between Evermay and an adjoining neighbor's garden. The overhanging tree looked like a variety of bald cypress. 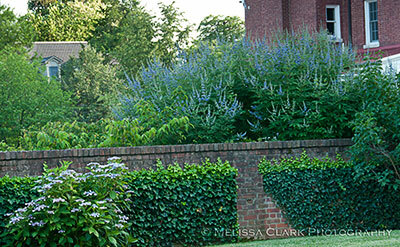 Clipped ivy and a lacecap hydrangea soften the brick walls on a lower terrace at Evermay that affords a beautiful "borrowed view" into the grounds of Dumbarton House on Q St. NW. The biggest surprise came when I ventured farther down towards an Asian-influenced pavilion overlooking the tennis court area. 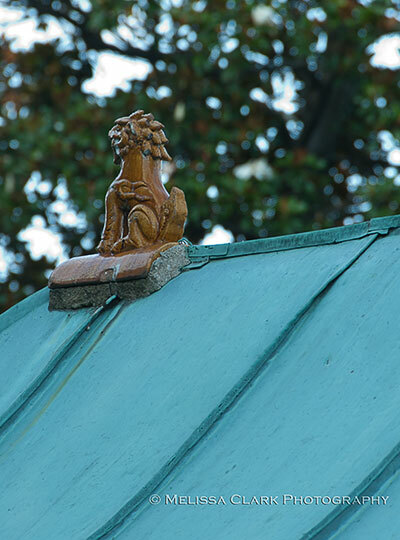 A small Asian carving atop the copper roof of a viewing pavilion for the tennis court. In front of me was an old Franklin tree (Franklinia altamaha), so rare that I have seen only one other in my life. This tree, discovered by John Bartram in his travels in Georgia in 1765, is no longer extant in the wild. I’ve never dared try to plant it for a client because it is notoriously difficult to establish. But here it was, trunk heaving out of a paved area next to a terrace overlooking the “Rabat Fountain,” dipping down and up again as it made itself quite at home. We were all amazed. A rare Franklinia altamaha growing on the terrace at Evermay. So, treasures and challenges alike await the next owner. I came away with a greater appreciation for the responsibility that will come with owning such an historic property – and a sense of anticipation and hope that the new owners, whoever they may be, will rise to the occasion. 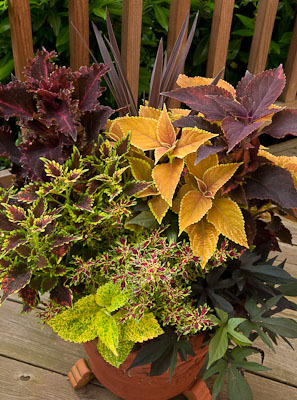 As a garden designer, I have a confession to make: I don’t think of myself as particularly inspired when it comes to containers (planters, pots, whatever you want to call them). My colleague Kripa is the star at our company, and I always love to look at and photograph her creations. Here are two of my favorites. This year, however, I decided to lift my own back deck out of the doldrums. For Mother’s Day weekend, with no one to entertain but myself, I headed to my local independent garden center. First, I picked out some shade-tolerant flowers for the front, north-facing stoop, where two square concrete planters that are actually too small for the space flank the front door. 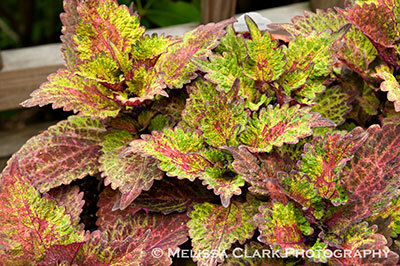 I picked out white caladiums, white impatiens, Begonia ‘Benitochiba,’ and a dark coleus. I’m still waiting for this combo to start filling in, unfortunately. I also took a photo of the leaves with my iPhone camera and while I like the image (a little dreamy and soft), the color is off. 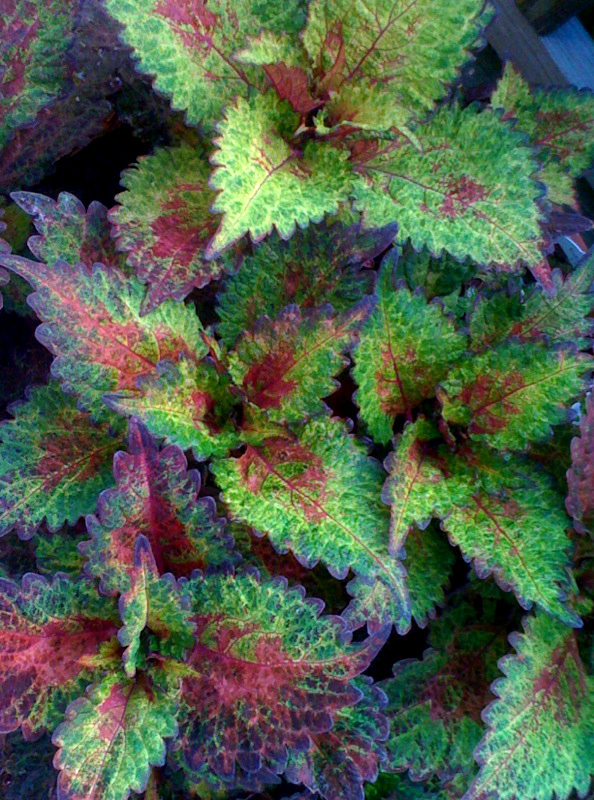 The iPhone photo of the same leaves is beautiful, but the color is off. I’ll never equal my fellow blogger Deborah‘s talent for creating stunning arrangements, but I think I’m making progress. 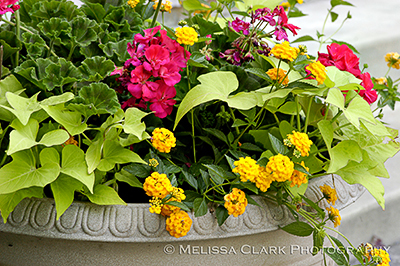 Check in with me this fall, when my biggest challenge rears its annual head – window boxes for a client with a shady front yard. Who wants COLOR. Help. 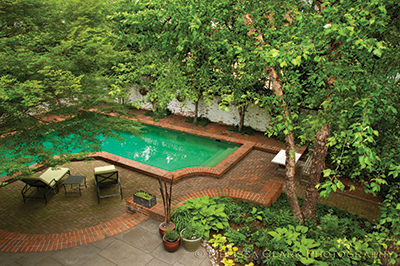 The Auclair-Jones garden, part of the Garden Conservancy’s Open Days tour in May this year, was designed by landscape architect Thomas Church. The DC area Open Days tour on May 22nd is now history. Over 150 visitors stopped in at each of the gardens (some had more visitors). I spent the day filling in for volunteers, getting change from a bank for all the twenty-dollar bills visitors proffered, and managed to get to all of the gardens myself, at least briefly. The “lead” garden on the tour (where many visitors stopped first to buy tickets and get directions to the other gardens) was a historical and visual delight. 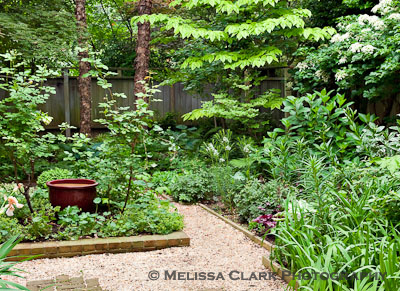 Tucked away in the Cleveland Park neighborhood of the District of Columbia is one of Thomas Church’s rare residential East Coast gardens. Church was an iconic landscape architect who spent most of his career designing gardens on the West Coast, including parts of the Stanford University campus. For more information about his career and accomplishments, visit The Cultural Landscape Foundation’s database. 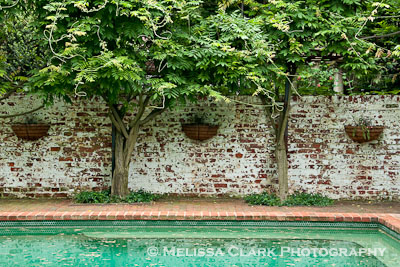 The repeating wisteria columns around the pool area. 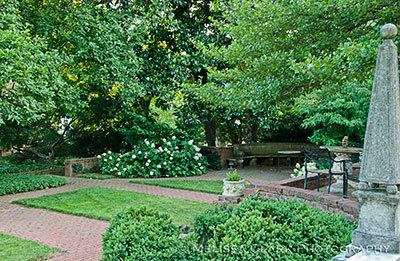 Church once said, “Gardens are for people,” and the owners instinctively understood this; when they bought the house three years ago they renovated portions of it, opening it up to the garden so that dining and entertaining areas are seamlessly connected to the outdoors. Beyond the lounge chairs, an open-air dining area connects the garden to the house. In the garden off the living room, the plant palette is more complex. Although the area is partially shady thanks to surrounding houses and mature trees (the river birches repeat from the front area of the garden to the back), there are a number of climbing roses and other sun-lovers that do very well, in addition to more shade-tolerant plants. 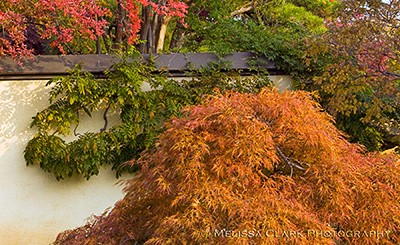 From any angle, this garden is a gem for owners and visitors alike. 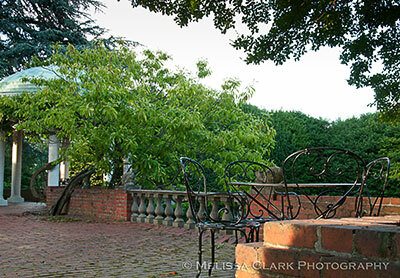 This garden is featured in my book on the Open Days Tours in DC, available from Blurb. com. See the “My Books” page for a preview or to order a copy.